Dubai, UAE – Al Habtoor Group, the UAE based conglomerate, has signed a deal with The Ritz-Carlton Hotel Company, L.L.C., which will see the opening of the first property from the luxury brand in the Hungarian capital. The announcement was made at the Arabian Travel Market 2015 (ATM), currently underway at the Dubai International Convention and Exhibition Centre. Located in the heart of Budapest, the 192 room hotel overlooks Erzsébet Square with commanding views of St. Stephen’s Basilica. The property will undergo renovation work, which is due for completion in early 2016, in order to align it with the Ritz-Carlton brand, making it a stunning member of a portfolio of hotels known for its exacting service and exceptional attention to detail. The partnership heightens Al Habtoor Group’s offering in the city by elevating an already exquisite property to a new luxurious destination. The announcement comes after a meeting with Khalaf Ahmad Al Habtoor, Chairman of the Al Habtoor Group and Arne Sorenson, President and CEO, Marriott International earlier this week. The official signing, conducted by Mohammed Al Habtoor, Vice-Chairman and CEO, Al Habtoor Group and Arne M. Sorenson, President and Chief Executive Officer of Marriott International took place at the Al Habtoor Group head office on Al Wasl Road on Monday May 4, 2015. The Al Habtoor Group first teamed up with Marriott International last year for its flagship hotel in Dubai, The Habtoor Grand Beach Resort & Spa, Autograph Collection. 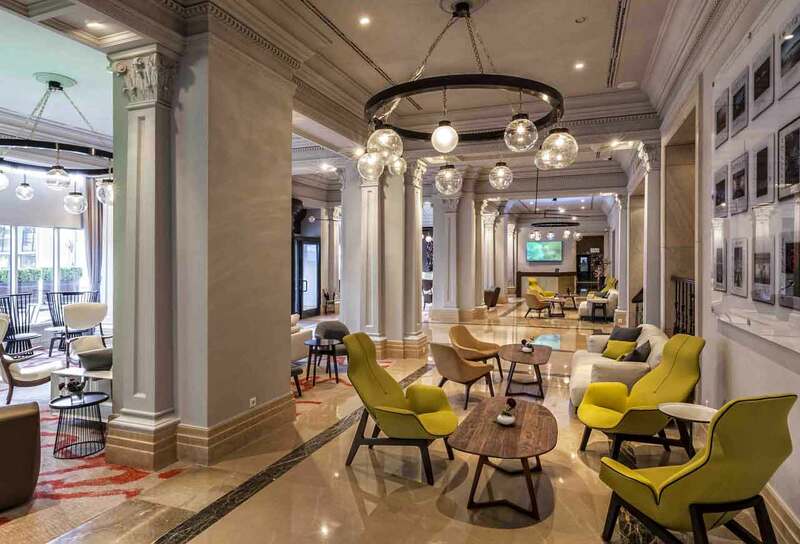 “Hungary represents the next great international expansion opportunity for The Ritz-Carlton,” said Herve Humler, president and chief operating officer. “We are especially pleased that our initial presence will be in Budapest, the country’s principal political, cultural, and commercial centre,’ he added. Budapest is home to some of Europe’s most impressive historical architecture, such as the Buda Castle, the Chain Bridge, Heroes’ Square, the Parliament and St. Stephen’s Basilica. It is widely known as a popular tourist destination in Central Europe; home to a number of World Heritage Sites such as the banks of the River Danube, the Buda Castle Quarter, Andrassy Avenue, Heroes Square and the Millennium Underground Railway (the second oldest in the world). The Al Habtoor Group hotel portfolio includes four properties in Dubai (Habtoor Grand Beach Resort & Spa, Autograph Collection, Metropolitan Palace Hotel, Metropolitan Hotel Deira, Waldorf Astoria Dubai Palm Jumeirah). Its international portfolio includes two hotels in the Hungarian capital Budapest (Le Méridien Budapest, InterContinental Hotel Budapest), two Hilton-branded hotels in Beirut, Lebanon (Hilton Beirut Habtoor Grand, Hilton Beirut Metropolitan Palace), and one property in the US (The Abraham Lincoln Springfield, a DoubleTree by Hilton Hotel). In addition, the Group is currently building three new hotel developments in Dubai including Al Habtoor City, a multi-use development featuring three Starwood-branded hotels (St. Regis, W hotel, Westin) alongside three high-rise residential towers; the St. Regis Dubai Al Habtoor Polo Resort & Club, a luxury hotel and residential development targeting the equestrian community, and the Metropolitan Sheikh Zayed Road.